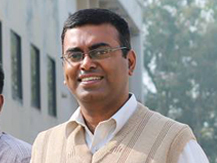 Anil Purushothaman is an Associate Professor of Information Technology in Technical Campus. Anil joined IPER as a Business Analyst in IPER Business Solutions Pvt. Limited, the Software development unit of IPER, in January 2005. His focus has been on software requirement gathering for the enterprises, ranging from food & beverages industry to travel business in UK. Anil Purushothaman is an Associate Professor of Information Technology in Technical Campus. Anil joined IPER as a Business Analyst in IPER Business Solutions Pvt. Limited, the Software development unit of IPER, in January 2005. His focus has been on software requirement gathering for the development of small to medium scale enterprises, ranging from food & beverages industry to travel business in UK. His work has majorly been development of Software Requirement Specification (SRS) and Functional Requirement Documents and use cases. Other than IT Business Analysis as core area, Anil is an enthusiast open-source implementer, has worked on the implementation of Moodle Learning Management System (LMS) in the IPER Technical Campus, and has also actively worked on mapped the business objectives of the Institutions with VTiger, an Open Source CRM Application Suite. His other areas of interests include Enterprise Resource Planning, Project Management, Decision Support Systems and Office Automation. MCA from IGNOU, Bhopal (MP) in 2004. Client: Top’n Town Ice-cream, a popular brand in Central India owned by Ramani Icecreams The application developed was a web-based .NET application with SQL Server as backend server, and run on Internet Browser application by the client. Key Modules included Purchase, Stores, Production, Product Warehousing, Sales Orders, Dispatch & Billing, Transport Logistics, & Quality Control. This project involved several inter-related modules and required an implementation plan that could bring about a smooth transition from manual system to a computerized system with least impact on the fabric of the Organisation. His role in the project was pivotal, it included scheduling and conducting client meetings, understanding and recording the details of the business processes, preparing Requirement understanding documents, identifying and categorizing problem areas and scheduling their development priorities on the basis of several factors, such as nature of inter-dependencies with other processes developed, complexity, importance, client’s immediate requirements, etc. Acting as the key communication bridge between the client and the software development team, he planned and conducted frequent training sessions to both the teams, in addition to developing the function specifications. Client: TSL, Hendon (London), United Kingdom The business domain was Travel Business in UK, and the client was a Software Consulting Company for Tour Operators and travel agencies in UK. The key modules of this fully online web application included booking reservations, distribution, CRM, Marketing, SRM, Integration with Internet Booking Engine Galileo. The application was developed in ASP.Net with SQL Server as backend. Anil’s key role in this project was to regularly collect change/update requirements from client through live verbal/text chats and emails, mapping the change requirements with the current application architecture and design the new specifications for approval. Client: Unsigned Radio Lounge, CA, USA The objective of this project was to develop a music web portal for the client where any music artists register and submit their music compositions get them played on flash player in the portal that simulated the functions of an internet radio. This web portal had two components – the public web portal and the administration module. The application was developed in Php with MySQL as backend. Anil’s role in this project was to analyze and document requirements that basically came in as an “idea” from the client and seeking a structured documentation on its basis. He worked in a tightly coupled environment with the development team to meet the client requirements quickly.